Start off your visit on the 7th (Tue): kick back and relax at Playa Manuel Antonio, kick back and relax at Playa Espadilla Norte, and then tour the pleasant surroundings at Parque Nahomi. Get ready for a full day of sightseeing on the 8th (Wed): take a peaceful walk through Naturalist Michael Araya Flores. To see where to stay, traveler tips, and more tourist information, go to the Manuel Antonio trip itinerary planning tool . New Orleans, USA to Manuel Antonio is an approximately 17-hour flight. Wrap up your sightseeing on the 8th (Wed) to allow time to drive to Uvita. 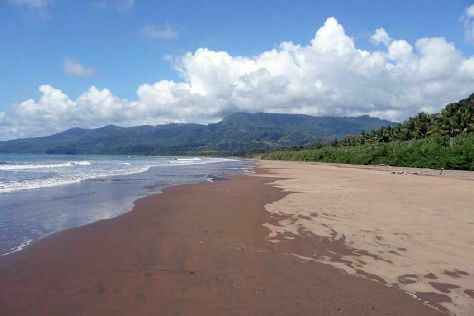 On the next day, explore the striking landscape of Parque Nacional Marino Ballena. To see photos, traveler tips, where to stay, and tourist information, use the Uvita trip planner. You can drive from Manuel Antonio to Uvita in 1.5 hours. Alternatively, you can take a bus. Finish up your sightseeing early on the 10th (Fri) so you can go by car to Puerto Viejo de Talamanca. On the 11th (Sat), kick back and relax at Puerto Viejo Beach and then take in nature's colorful creations at Finca La Isla. Here are some ideas for day two: explore the striking landscape of Cahuita National Park and then have some family-friendly fun at Yesland Mini Golf. To see reviews, maps, photos, and tourist information, you can read our Puerto Viejo de Talamanca trip itinerary site . Drive from Uvita to Puerto Viejo de Talamanca in 7.5 hours. Alternatively, you can do a combination of bus and shuttle; or take a bus. Wrap up your sightseeing on the 12th (Sun) early enough to drive to La Fortuna de San Carlos. On the 13th (Mon), trek along Ecocentro Danaus, let the river carry you with a rafting and tubing tour, and then witness a stunning natural landmark at Paradise Hot Springs. On the 14th (Tue), you'll have a packed day of sightseeing: take in the natural beauty of Tabacon Hot Springs and then admire the natural beauty at Arenal Natura Ecological Park. To find reviews, more things to do, where to stay, and other tourist information, you can read our La Fortuna de San Carlos tour itinerary planning website . Traveling by car from Puerto Viejo de Talamanca to La Fortuna de San Carlos takes 5 hours. Alternatively, you can do a combination of bus and car; or take a bus. Cap off your sightseeing on the 14th (Tue) early enough to travel back home.